Enter the Hostess Rascal Flatts Sweepstakes now for an opportunity to win a three (3) day/two (2) night trip for two to see Rascal Flatts Live (Upcoming concert) including air transportation, hotel accommodations, concert tickets & transfers within the 48 contiguous United States or one of the thousands of other exciting prizes. How To Enter: Go to this link:SweetCountrySummer.com and follow the online instructions to register by entering all information requested on the registration form and once you filled out the entry form now Click on the submit button to complete the registration form. 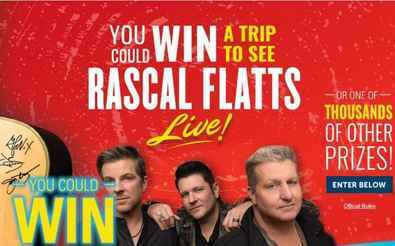 Prizes: One grand prize winner will win a three (3) day/two (2) night trip for the winner and one (1) guest to attend a Sponsor-specified Rascal Flatts concert within the 48 contiguous United States. Trip includes round-trip economy-class air transportation for two (2) from the major airport nearest winner’s home to destination city, two (2) nights’ hotel accommodations (one (1) room/double occupancy) at a Sponsor-specified hotel, round-trip Sponsor-specified ground transfers between airport and hotel in destination city, two (2) tickets to the Concert and round trip Sponsor-specified ground transfers between the Concert and hotel. The ARV of the Grand Prize is $5,000. Who’s Sponsor: The Sponsor of the Sweepstakes is Hostess Brands, LLC, 1 E. Armour Blvd., Kansas City, MO 64111.